Addiction is always bad regardless of what you are addicted to. Gambling addiction is no exception. Millions of people around the world practice responsible gambling but a few gamblers go over the edge. These gamblers end up losing more than just money because of the hobby. When gambling causes people to damage their relationships and to lose their financial security it ceases to be the fun hobby that it is supposed to be. Players that have reached this stage need to seek help promptly before the problem becomes too big. 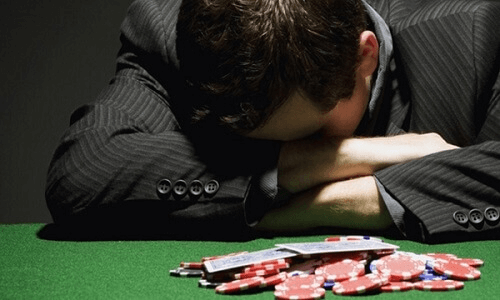 Gambling addiction is easily described as the itch to continue gambling even when it is harmful. However, this definition does not paint a real image of the problem. Many health experts attribute this kind of addiction to impulse control disorders. This means that the individual may be suffering mental illness. Common mental illnesses that cause gambling addiction include depression and anxiety. And gambling can also cause mental illness when untreated. Up to 3% of all gamblers suffer from gambling addiction. This might not be a big number when you are looking at the casino game players in your work area. However, when you look at the entire world population, the figure becomes very high. It is therefore up to families and communities to identify the problem. Gambling addiction comes in many stages. It is essential that people are able to identify people at all the levels. After all, a stitch in time saves. We shall start with the least severe. At this level, the player does not look like they have a gambling problem on the surface. There is a need for a closer look which usually requires family intervention. A person at this level does not want to stop gambling even after realizing they are gambling more and more. Other common signs are lying to loved ones and an uncontrollable desire to chase after losses. This is a more easily recognisable form of gambling addiction. However, it is very subtle since the gambler can go for long periods without gambling. Because of this, they manage to convince people that they have their gambling under control. Such casino game players bet excessively each time they gamble. This is the worst kind of addiction and the easiest to see. The gambler cannot control the gambling. Even if it harms them or their loved ones. A common sign is that the person will look for any opportunity to gamble. And they will continue gambling even when they know they do not have money to cover the bet.